Hymenopus coronatus (Orchid Mantis) is from the rain forests of Southeast Asia. 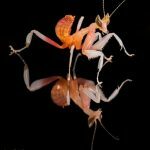 It is one of several species known as ‘flower mantises’, from their resemblance and behaviour. This species is characterized by brilliant colouring and a structure finely adapted for camouflage, mimicking parts of the orchid flower. The four walking legs resemble flower petals, the raptorial front pair being used for grasping prey.